Taking advantage of our technologically developed manufacturing facility, we are engaged in the creation of a huge gamut of Rubber Diaphragm. 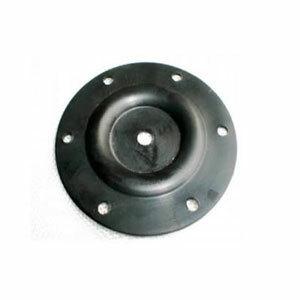 Rubber diaphragm is resistant to a wide range of media on various pressures. The task of our range is to control the control, switch, pump, valve and accumulator functions. Demanded in auto and various engineering industries, keeping in mind the criteria of the market, the goods presented were manufactured from ancient quality rubber and leading approaches. All these goods are available in size, thickness and other specialties. We, Anant Rubber Products is a leading manufacturer and supplier of high performance Rubber Diaphragm. Our reputation for high performance and quality has been made on our ability to provide designing, engineering and manufacturing solutions to our valued customers to meet their most demanding applications. Anant Rubber maintains a modern manufacturing facility having Kneader, Mixing Mill and compression moulding machineries along with technically-oriented work force to meet our clients’ critical specifications and tolerances. The root of the rubber diaphragm is to prevent inappropriate contact between different medias (such as gas and fluid) and should be flexible enough to create mobility during flow control. Tensile and elongation of rubber allows it to control and control various pressures during operation and work. We have a lot of years of experience in the manufacturing of Rubber Diaphragms, including reinforced and unreinforced flexible rubber diaphragms. All our diaphragms are manufactured under strict quality control to ensure zero rejection of the medieval life cycle and longevity.